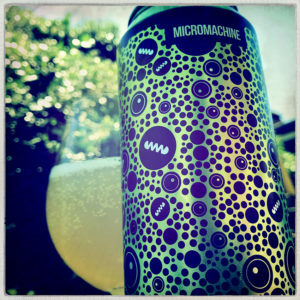 Refreshing like a glass of water is refreshing, Micromachine has been brewed in collaboration with Northern Monk, and it’s a low alcohol IPA. But the thing is, everything in it is so far away and flimsy that the water is the main flavour. There’s a polite whisper of lemony hops and maybe just the hope of some malty sweetness and then there’s water, lots and lots of it. My first impression was that this tastes how I imagine the water you use to rinse out your festival glass might taste. 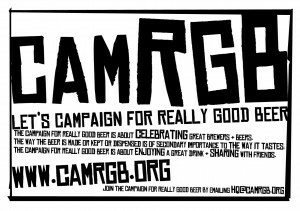 This entry was posted in Beer Review, CAMRGB and tagged Beer, Beer Review, CAMRGB, Can, Canned beer, Drinking, IPA, Low ABV, Low Alcohol Beer. Bookmark the permalink. After a half hour walk across Manchester in the heat last week, and a half of this in the Port Street Beer House, I very much did get it. Not a beer I’d go for again, but in the (literal) heat of the moment it was perfect.